Whether you need a how-to guide for changing your ad text, or you want to get into the nitty gritty of online advertising strategy, you can join the discussion in the new community section. In addition to help from other advertisers and Top Contributors, you can also get answers and support from the Google team. 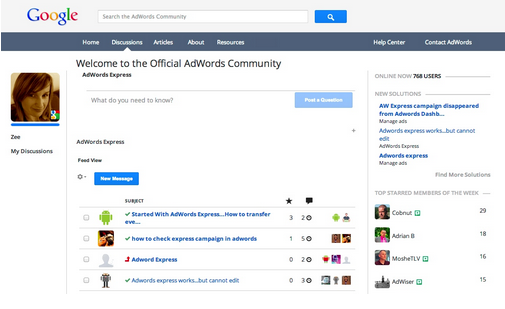 The AdWords Express section is currently available in the English language AdWords Community. Calling all AdWords Express advertisers! Now there’s a place to ask questions, post answers, and learn from other advertisers: the AdWords Express section of the AdWords community.